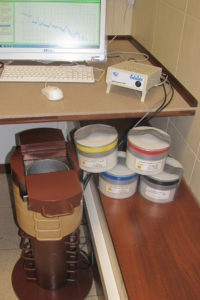 TDSP-1 spectrometer is a stand-alone device for connecting the scintillation probes. Depending on the probe and scintillator it can be used in alpha, beta and gamma spectrometry. Having compact housing, it contains HV power supply, pulse shaper, amplifier, and a multichannel analyzer. The computer software provides the control of the spectrometer and allows to perform various types of analyses (alpha, beta radiochemistry, gamma, incl. energy and efficiency calibration). We offer the following scintillation probes for use with TDSP-1: universal with changeable alpha, beta and gamma D40 scintillators or unchangeable 2” or 3” NaI(Tl). The probes are adapted to be installed in lead shielding (probe diameter 65mm). TDSP-1 can be used for measuring radioactivity in water, soil, rock, food, building material, industrial waste and other samples.